Our since thanks to the special guests: Dr. Subhakanta Behera, Consul General of India, Melbourne, and Prof. Amitabh Mattoo, Director, Australia India Institute for gracing the occasion. Launch of book titled: 15 Pratinidhi Kahaniya by Dr. Subhakanta Behera. 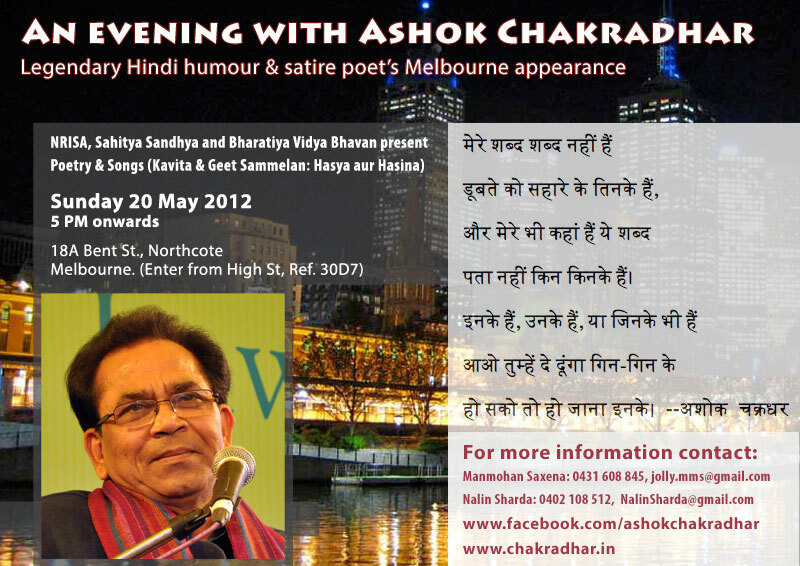 Sahitya Sangam collaborated with NRISA to organise a very successful function with Prof. Ashok Chakradhar on 20 May 2012, his first in Melbourne. 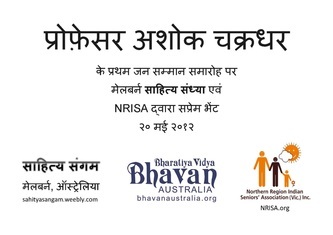 A poetry book called Guldasta was published by Bharatiya Vidya Bhavan, Australia in 2010, with contributions from 47 poets / poetesses of Hindi and Urdu who live in Australia. It is a unique book in which each Hindi poem is translated into Urdu, and each Urdu poem into Hindi. The idea was initiated in 2005 by Mr. Abbas Raza Alvi of Sydney. The poets and poetesses from Melbourne who have their poems included in this collection are: Arshad Saeed, Hari Krishan Julka, Harihar Jha, Mridula Kakkad, Nalin Kant, Rajender Chopra Rajan, Saif Chopra, Subhash Sharma, and Syed Shabbir Haider. Guldasta was launched first in the New South Wales Parliament. On 4th November 2010 it was launched at the India Talkies in Melbourne by the Mr. Teb Bailleu, leader of the Liberal party. Reading of the poems was done at the Sahitya Sandhya held on 6th Nov at the Indian Consul General office, 344 St. Kilda Rd., Melbourne. Following photos taken on the occasion courtesy South Asia Times (SAT). Dr. Dinesh Srivastava being presented an award of excellence by the Governor of Victoria. Dr. Dinesh Srivastava was invited to the Governor House on 21 September, 2010 and was presented an award of excellence by the Governor of Victoria in the presence of approximately 200 guests, which included Victoria's Premier, Deputy Premier and Police Commissioner etc. 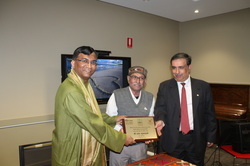 He was given a certificate and two medals carrying the Logo of Australia. This was his third visit to the Governor House. The earlier two visits were in 1970's , when he was awarded shields for community service in 1977 and 78 for raising substantial amounts of funds for the 'Victorian Association of Deserted Children', World Vision etc. On that occasion, Johny Farnham, a young boy then, sang for the audience. 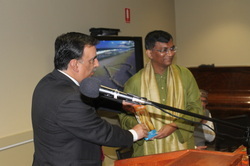 7 March 2009: Holi Ka Hangam - Ek Hasya Kavi Sammelan was very popular with guest poet from Sydney, Mrs. Rekha Rajavanshi joining the program, and Mr. Anil Kumar Gupta, Cultural Consul of India in Melbourne as the Chief Guest. 4 July 2009: Sahitya Sandhya was attended by many interstate and overseas guests. 5 Sept 2009: Hindi Diwas was celebrated to honor the Hindi language, with Dr. Dinesh Srivastava as the Chief Guest. 7 Nov 2009, Celebrated Diwali. Photo: All Poets at Hindi Diwas, celebrated on 5 Sept. 2009, Kew library, Melbourne. 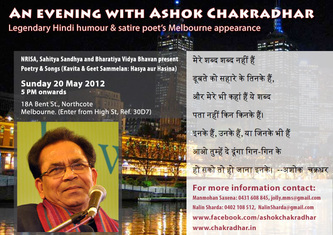 Sahitya Sangam endeavours to create a sangam of various literary works, such as Hindi and Urdu poetry recited at Sahitya Sandhya organised in Melbourne, Australia. The main language is Hindustani: a mixture of Hindi, Urdu, English and other Indian languages. 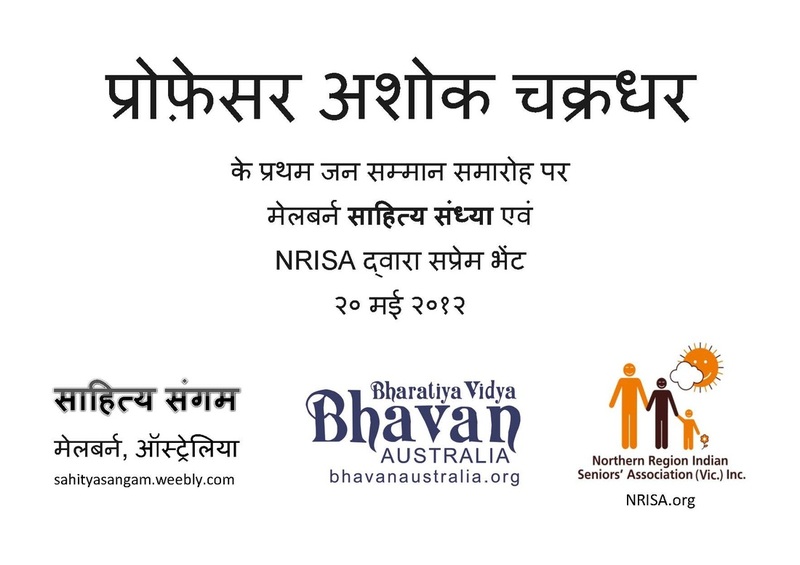 However, discourse in all Indian languages is encouraged to share Indian-Australian experiences as poetry, jokes and short stories.